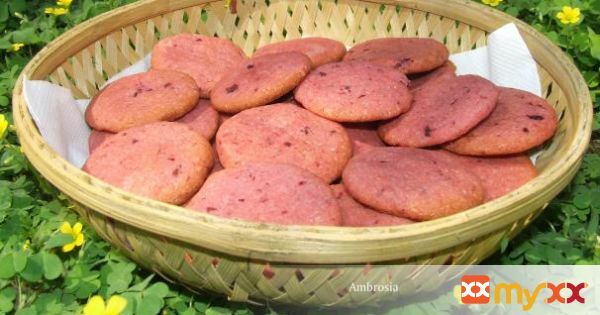 BEET COOKIES MADE WITH WHOLE WHEAT FLOUR HAVE THE GOODNESS OF WHOLE GRAIN AND BEETS. THE COLOUR MAKES THE COOKIES IRRESISTIBLE. KIDS JUST LOVE IT! 1. Pre-heat the oven to 200 degrees C. Cover the baking tray with foil. 2. Boil a medium size beetroot till just tender. 3. Peel when cold and puree in a blender. 5. Beat butter and sugar till light and fluffy. 6. Mix salt and beetroot puree. 7. Add flour and mix with hands to get soft dough. 8. Take marble size balls of the dough and press between palms to get cookies of even thickness. 9. Bake in the pre heated oven for 10 minutes or when the edges just begin to turn golden.